The Italian and I stood for quite some time with our noses pressed to the window peering in at all the different samples of coffee beans and tea leaves displayed in little bowls. We marvelled at their weird and wonderful names, Guatemala Huehuetenango, Maragogype Elephant Beans and Nicaragua La Illusion SC20, Russian Caravan, Puerh Bird Nests and Kenya Bop, which sounded like the title of one of my ‘70s African funk albums. 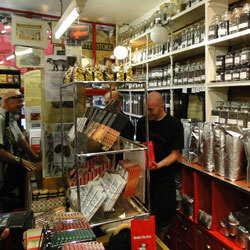 The Algerian Coffee Stores on Soho’s Old Compton Street is a veritable Aladdin’s Cave for lovers of coffee and tea. It first opened its doors in 1887. When we visited, 123 years later, they were still busy. There was a constant stream of people entering and leaving the place, we had to edge our way in. 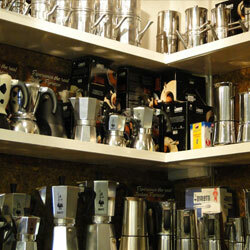 The Algerian Coffee Store also sells an impressive range of coffee grinders and coffee making machines. I always use beans when I make coffee, I like to grind the beans myself, I love the whole ritual. And the smell that’s released when coffee beans are ground is just fantastic, it gets my nostrils all of a quiver and shouting ‘Yessss, let’s party!’ – in my humble opinion it’s up there with the smell of onions frying and Miss Dior. I was tempted by one of the manual grinders; my electric one goes just too fast for life in the slow lane and makes way too much noise first thing in the morning. It’s just not manual enough. Had I been in the market for a cafetiere, a Napoletana, a Russian copper Ibrick or a Turkish coffee pot they would have been able to oblige me. In the end I settled for a replacement rubber seal for my well-used traditional Italian Moka aluminium coffee maker, not an easy thing to find, I’d been hunting one down for a long time. If you visit there, sample a cup of their coffee, just as long as you don’t mind drinking it whilst standing in the shop. Or, if you prefer, you can take it away. You’ll never go to Starbucks ever again.